What it is: Apple released the latest version of macOS 10.13.1. The first rule of updating anything on your computer is to make sure you have backups. That’s because operating system updates can completely wreck a computer so plan on it. Of course, operating system upgrades tend to be much smoother and more reliable than the old days of Windows updates that often caused more problems than they solved. One reason why people tend to prefer the Macintosh over Windows PCs is because the Macintosh is generally far more reliable than a Windows PC where operating system updates actually fix problems rather than create new ones. In general, it’s best to keep your operating system up to date as often as possible because the last thing you want to do is update your computer from a really old version of the operating system to the latest version. That’s a recipe for disaster. If you keep your operating system version up to date, then the transition from your current version to the latest version will be minimal and likely far more successful. The latest version of macOS fixes a huge potential problem involving a flaw known as KRACK wi-fi exploit that allows hackers to potentially compromise a WiFi connection. That’s why you want the latest version of macOS to guard and protect your Macintosh against this problem. Other than patching this potentially dangerous flaw, macOS simply fixes other minor bugs to make your Macintosh more reliable. When updating a Macintosh to a new version of an operating system, you can basically let the process go and come back to your Macintosh later when the update process is done. When updating a Windows PC, you often have to hold your breath and pray nothing goes wrong. In most cases, nothing will go wrong but the experience in updating other operating systems other than macOS isn’t always fun, consistent, or reliable. This simple difference between macOS and Windows highlights the reason why Macintosh users love their computers while Windows PC users generally tolerate their PCs. When you want security and reliability with fewer headaches, you generally want an Apple product like the Macintosh. To read more about the latest macOS update, click here. What it is: Microsoft officially discontinued their motion-tracking Kinect. Back in 2010, Nintendo had a hit with the Wii controller that you held and moved around to simulate swinging a baseball bat or a tennis racket. So Microsoft came out with something even more amazing, the Kinect, a motion tracking device that didn’t need to be held at all. Bye tanning in front of a Kinect, you could control a game just by moving your body around. Yet seven years later Microsoft has discontinued the Kinect. Even after Microsoft created frameworks to help developers create Kinect-enabled programs, the Kinect never found a practical use beyond gaming despite surgeons using the Kinect during operations to avoid contaminating their hands by touching something. The Kinect was another example of Microsoft being ahead of everyone else and introducing technology without having a clue how to apply it for practical purposes for the general public. The company that developed the Kinect, PrimeSense, was recently acquired by Apple, thereby depriving Microsoft of the brains behind the original technology. It doesn’t matter though because Microsoft had a huge head start with motion tracking and failed to capitalize on it, just like they had a huge head start with tablets, smart watches, and smartphones. In each case, Microsoft failed to optimize their advanced technology for the masses and let it die instead. There are plenty of smart people at Microsoft. Unfortunately Microsoft seems to lack a coherent, long-term vision. Instead they focus on reacting instead of planning. Windows Phone and Kin was a reaction to the iPhone, Microsoft Band was a reaction to the Apple Watch, Zune was a reaction to the iPod, Windows RT was a reaction to the iPad, Silverlight was a reaction to Adobe Flash, and Kinect was a reaction to the Wii. Microsoft’s plan is simply to copy rivals and try to offer something better. Sometimes they succeed (Windows) but lately they simply waste time and resources pursuing dead-ends that ultimately get cancelled. If Microsoft would simply plan ahead, regardless of what others are doing, and focus on making great products, perhaps they could offer products that people would eagerly buy. Microsoft shows what happens when you pursue the same formula that worked once (Windows reacting to the Macintosh) but fails time and time again. They an insanity is doing the same thing and expecting different results. If that’s true, then management at Microsoft should be certifiably insane for missing so many opportunities to exploit their advanced technology until others catch up and surpass them. To read more about the death of the Kinect, click here. What it is: Major corporations are offering employees a Macintosh instead of a Windows PC. At one time, Microsoft made software for other operating systems. When Microsoft bought an operating system and named it PC-DOS for IBM, they renamed it as MS-DOS for IBM compatibles. Pretty soon businesses standardized around MS-DOS and later Windows. Microsoft then ventured into the application software market to compete in the word processor, spreadsheet, and database markets that were formerly dominated by WordStar and WordPerfect, Lotus 1-2-3, and dBASE. With the shift to Windows, Microsoft had the only major applications ready for Windows, so the corporate world that shifted to Windows also shifted to Microsoft software. When Microsoft sold both Windows and Microsoft Office, they completely dominated the software market for decades. Then something happened. Microsoft took too long to update Windows XP and when they did, they came out with a loser called Vista. Vista taught everyone that operating system upgrades were no longer necessary. To this day, you can still find many corporations running Windows XP. Then Apple came out with the iPhone and iPad to go along with he Macintosh. Suddenly people were bringing their iPhones to work and ignoring the corporate standard of Blackberry smartphones. That helped usher in the BYOD (Bring Your Own Device) movement that shifted enterprise computing from largely Microsoft solutions to a mix of Microsoft, Android, and iOS solutions. Now that people have gotten a taste of Apple products through the iPhone and iPad, many are also choosing the Macintosh and influencing corporate decisions. Delta Airlines, General Electric, and IBM are just a few major corporations that now offer employees a choice of a Windows PC or a Macintosh. Not surprisingly, the enterprise market is discovering that the Macintosh may be more expensive initially, but offers lower maintenance and support costs over the long run. That means a Macintosh is simply more cost effective than a Windows PC while giving workers greater satisfaction. Put simply, more people prefer a Macintosh than a Windows PC. With companies standardizing around iOS, Microsoft is now reverting back to a software company for other people’s operating systems. Microsoft makes plenty of mobile apps for both Android and iOS along with macOS. As the Windows monopoly fades under the dual pressure of the iPad and Macintosh, Microsoft’s fortunes lay in other areas beyond operating systems. Microsoft lacks a mobile operating system and a wearable computing operating system, yet the future is mobile computing and wearable computing. The future for Microsoft points to supporting other people’s operating systems as Windows fades from relevance. Microsoft will still be around. People just won’t rely on their operating systems any more no matter what it’s called (Vista, Windows 8, Windows RT, Windows Mobile, Windows CE, etc. ), and that’s perfectly okay. To read more about how corporations are embracing the Macintosh and Apple products, click here. What it is: A doctor used an iPhone along with an ultrasound device to detect his own cancer. John Martin is a vascular surgeon who just became chief medical officer for a startup called Butterfly Network, which has produced a pocket-sized ultrasound device that works with the iPhone. To test out the ultrasound device, Dr. Martin decided to investigate his own throat, which was feeling uncomfortable lately. The ultrasound device sent an image to his smartphone, which showed him a dark, three-centimeter mass. “I was enough of a doctor to know I was in trouble,” he says. It was squamous-cell cancer. With the Apple Watch beginning to dominate the real-time health monitoring market, low-cost devices like an ultrasound, connected to a smartphone, can provide low-cost medical equipment to places around the world that can’t afford the expense or space to buy and store a much larger medical device. handheld medical devices, connected to smartphones, will likely become the norm and grow in popularity. The low-cost medical devices can give patients the chance to capture images of their own body parts and send them to doctors to examine, eliminating the need to visit a doctor. Or such arrangements could allow doctors to diagnose patients in remote areas and send images to specialists who may live far away. In any case, low-cost medical devices paired with smartphones promise to revolutionize the health industry by providing health care at low cost to more people around the planet. Combine low-cost medical devices with smartphones and Apple’s foundation of HealthKit, CareKit, and ResearchKit along with greater security for privacy of data, and you can see that the iPhone will likely benefit from the coming market for low-cost medical devices that pair with smartphones. Smartphones and the iPhone in particular will help usher in a new era of remote health care. It’s not feasible to put a trained doctor with expensive equipment everywhere, but it is feasible to put low-cost medical devices and smartphones everywhere. Health will drive adoption of the Apple Watch so people can monitor their health in real-time. Health will also drive greater adoption of the iPhone because the iPhone is essentially a computer in your pocket that you can take anywhere. With Apple’s emphasis on privacy and security, it’s likely the iPhone will become the trusted health care smartphone rather than Android because Android’s fragmentation among operating system versions and openness that allows malware to sneak in far too easily. The health care industry is about to undergo a massive revolution spurred on by the smartphone and the iPhone and Apple Watch in particular. Watch for the resistance from hospitals that make the bulk of their money charging high prices for specialized services that can be largely duplicated with low-cost devices and smartphones. The health revolution is just beginning. To read more about the doctor who diagnosed his own cancer with a smartphone, click here. What it is: Apple recently acquired PowerbyProxi, a company that designs wireless power solutions. It’s no secret that Apple wants to control and own all hardware in their devices. That’s why Apple designed their own ARM-based processors that are currently the fastest ARM processors on the market. That’s also why Apple dumped the graphics processor from Imagination Technologies and developed their own graphics processor instead. By owning and optimizing hardware for their products, Apple can create the best user experience and keep rivals form buying the same components that they do. This forces rivals to use off the shelf components that aren’t optimized for any particular device, resulting in slower and less efficient results. The latest Apple acquisition is PowerbyProxi, a wireless charging company. Right now, Apple supports a wireless charging standard called Qi, but what Appel will likely do with their own wireless charging technology is follow the Qi standard while making their own devices charge faster than rival devices. That way Apple can support the same wireless standard as everyone else while still offering a superior product. Apple likely can’t offer a proprietary wireless charging solution since that would hamper widespread adoption, so the other best option is to follow a standard but make Apple devices work better on that standard. By acquiring a wireless power company, Apple is clearly focused on making their wireless products superior. This will further separate Apple products from rival products. As the gap between Apple products and rival products widens, it will be clear to everyone which products offer the best user experience. Most likely the results of this acquisition won’t appear for several more years so five years from now, don’t be surprised if Apple announces a revolutionary new wireless charging solution that came from PowerbyProxi. Wireless charging is the future and that future will likely involve wireless charging that doesn’t involve contact with a mat or charging device like the Apple Watch, but charging through the air like WiFi. When that future arrives, power cords will look like the quaint antiques they already are. To read more about Apple’s latest acquisition for wireless charging, click here. 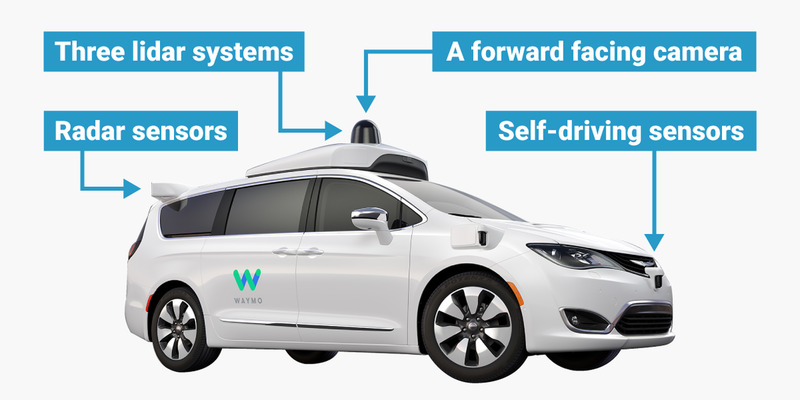 What it is: Self-driving cars are coming. The question is how will they change our lives? When rumors spread about Apple developing a car dubbed the Apple Car, many people thought it would be an electric or hydrogen fueled vehicle that Apple would sell to individuals. What’s far more likely is that Apple is looking towards a future where car ownership is largely obsolete. Cars are expensive to own and maintain. Even worse, they sit idle 95% of the time, taking up space and requiring large parking lots or garages to store them while they sit idly most of the time. That’s a tremendous waste of space. As the cost of cars continues to rise, car ownership will become less appealing, especially with the combination of ride-sharing services and self-driving cars emerges. This combination promises to keep cars moving constantly, picking up and dropping off passengers, while greatly reducing the need to own a car yourself. Without paying for a car along with insurance or gas, guess which industries are going to get hit negatively first? Car makers and car dealers will be the first to get hurt as car ownership becomes too expensive and inconvenient while ride-sharing becomes far easier and cheaper. Then expect oil companies to lose a huge amount of income from gasoline refining. Gas stations will need to shift to electric fast-chargers, but even then, what’s the point of going to a gas station to get an electric charge when electric charging stations can be placed in ordinary parking lots? Gas stations made sense when you needed a single, safe place to deposit volatile fuel. Gas stations make less sense when focusing on electric charging stations that can be placed anywhere. Toss in solar panels on the roof of your car to power it and gas stations in any form make less and less sense in the long term. Insurance companies will have fewer customers as fewer people own cars. Parking lots will disappear and become homes or parks since there’s no need to create concrete deserts for parking any more. In short, ride-sharing and self-driving cars promise to radically change the way we live. People can commute further since the time of the commute won’t be as critical since you can sleep, work, read a book, or watch a movie during your commute since you won’t have to drive yourself. Then you can relax and live further away from work. Most likely, mass transit and ride-sharing services can work together. Mass transit can take large amounts of people faster while ride-sharing can get people to those mass transit stations. Without mass transit, ride-sharing services threaten to turn our cities into crowded congested traffic jams like today, only replacing drivers with self-driving cars, which is no solution at all. The future is clear. It won’t be anything like the present. To read more about the impact of ride-sharing services and self-driving cars, click here.